I have wanted to make these for years but just never got around to it but eventually I did try and they were scrumptious!!! I made some individual ones and also a larger one. Step 1: To make the biscuit base add the crushed digestive biscuits into a bowl. To crush them I place the biscuits into a bag and then roll with a rolling pin, but you could use other methods). Then add the 75g melted butter and mix. Step 2: Place the biscuit base into individual glasses or one cake bowl if preferred. Pat down on the biscuit base and then place into the Fridge for about 30 mins to set. Step 3: Start making the caramel while the base in the Fridge. In a pan add the sugar and 150g butter and melt on a medium heat. Keep stirring until the sugar melts and mixes. Step 4: Then add the carnation milk to the pan and bring to the boil and then remove from the heat. Step 5: Remove the biscuit bases from the fridge and pour over the caramel and then return to the fridge until cooled completely. Step 6: Once cooled, remove and then place the chopped bananas onto the caramel. Step 7: Place the cream into a bowl and whip with electric beaters until the cream is thick but not stiff. Then place over the top of the bananas. Step 8: Grate the chocolate over the cream and the dessert is now ready to be served. Enjoy. These look amazing! 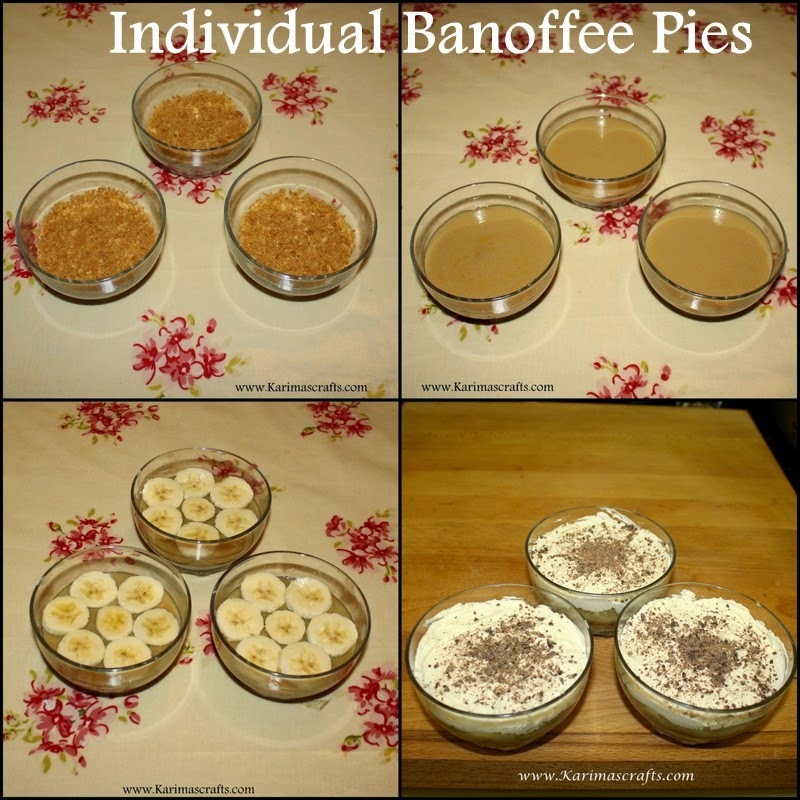 my husband loves banoffee pie, I think I need to make these for him. Fantastic read thanks for sharing do pop over and share some thought about Superiority Is Not Based Upon Wealth And Property, thanks. i love banoffee pie! i made one over the weekend for the first time ever and it was delish and so simple to make (my kind of dessert!) i like the idea of making them in individual portions, great idea.